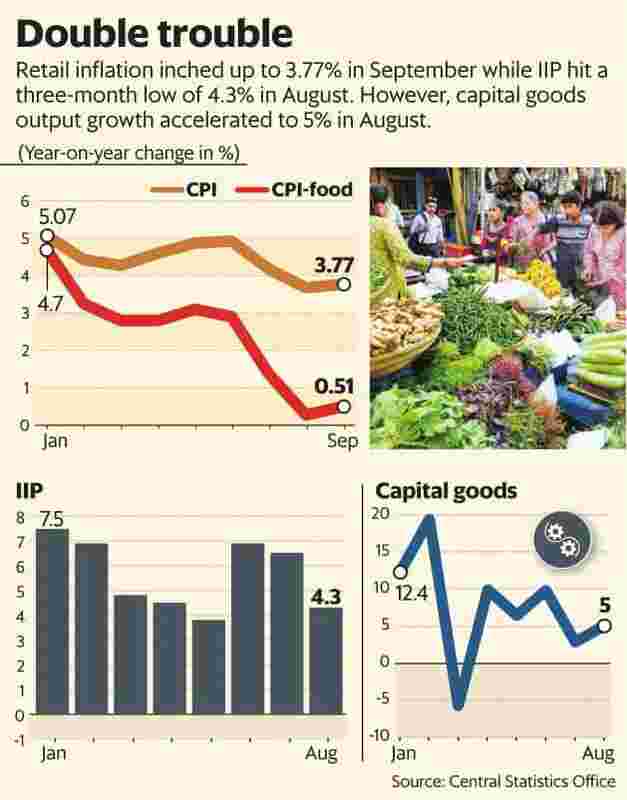 New Delhi: India’s retail inflation accelerated in September, though it remained within the central bank’s permissible limit, and factory output fell to a three-month low in August because of a higher base effect—a double whammy for the economy. Consumer price index (CPI)-based inflation rose from 3.69% in August to 3.77% in September while the index of industrial production (IIP) fell from 6.5% in July to 4.3% in August, data released by the Central Statistics Office on Friday showed. The volatility in the IIP growth rate indicates that industrial recovery remains uneven and fragile ahead of the festive season. The Reserve Bank of India’s (RBI’s) latest business expectations index, however, shows industrial activity improved in the July quarter. The depreciating rupee and rising crude oil prices and revision in minimum support prices for farm produce are expected to put upward pressure on retail inflation. The uneven distribution of monsoon rainfall may limit the growth in kharif output and rural incomes in the coming months. “However, the rise in reservoir levels across most regions would support a brisk pace of rabi sowing, once it commences," said Aditi Nayar, principal economist at Icra Ltd, a credit rating agency. Devendra Kumar Pant, chief economist at India Ratings & Research, said that while the present inflation trajectory is in line with the RBI’s inflation targeting approach, the likelihood of inflation touching around 5% in 4QFY19 is high. Both Pant and Nayar expect RBI to hike the policy rate at least once in the rest of the financial year ending 31 March 2019. “The risks, combined with RBI’s change in stance from neutral to calibrated tightening, suggest a likely rate hike in the December policy review. At present, we expect further rate hikes of 25-50 basis points in the remainder of FY2019," Nayar said. The International Monetary Fund (IMF) on Tuesday called for further tightening of monetary policy in India as inflation was expected to pick up. The fund maintained India’s growth projection at 7.3% for 2018-19. “Monetary policy should be tightened to re-anchor expectations where inflation continues to be high (as recently done in Argentina), where it is increasing further in the wake of a sharp currency depreciation (Turkey), or where it is expected to pick up (India)," the IMF said in its bi-annual World Economic Outlook report. After two successive hikes, the RBI’s monetary policy committee (MPC) kept interest rates unchanged on 5 October, citing a benign inflation trajectory and downward revision of inflation projections. The MPC lowered its inflation projection to 3.9-4.5% from 4.8% for the second half of the current financial year. “The inflation outlook calls for a close vigil over the next few months, especially because the output gap has virtually closed and several upside risks persist," the MPC said. The IMF estimates inflation in India to rise from 3.6% in 2017-18 to 4.7% in 2018-19 amid accelerating demand and rising fuel prices. It said core inflation, excluding all food and energy items, in India had risen to about 6% as a result of a narrowing output gap and pass-through effects of higher energy prices and exchange rate depreciation.